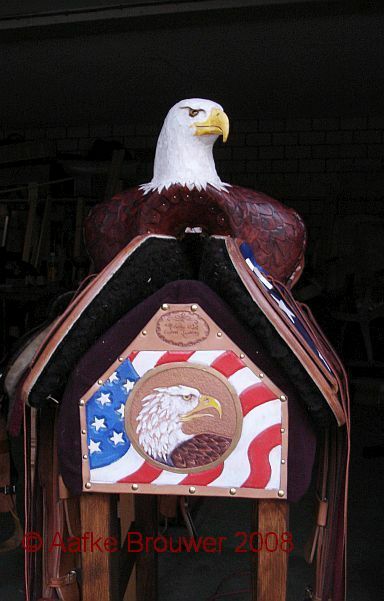 The American Eagle saddle is a design I made on a vintage tree which didn’t have a horn. 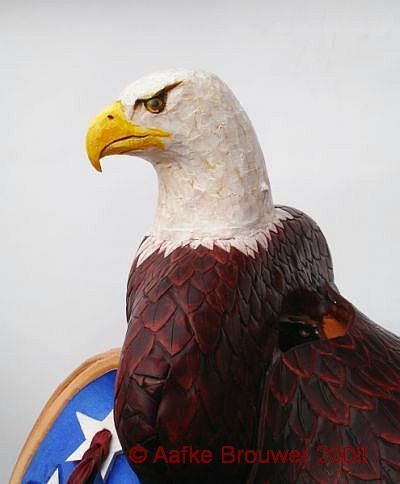 That gave me the room to add the Eagle head. 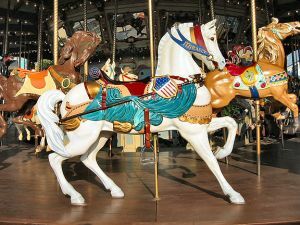 The idea is inspired by American carousels. The american carousels from around 1900 are amazing. I thought why not design and actually make an original saddle, a really special saddle like they carved on the carousel horses? 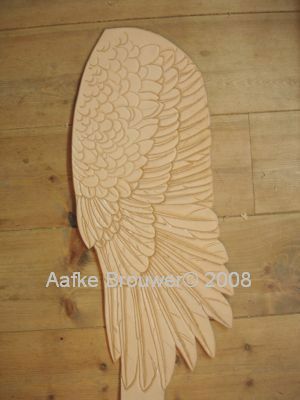 You know, the very, very first attempt I made in leather carving was actually a feather! 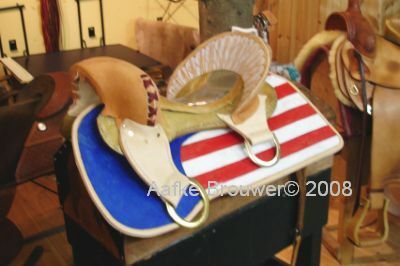 here you see one of the saddle skirts, tooled and colored. Sorry for the bad quality. The cantle is carved, (that was quite difficult) and the rigging is in place. There’s still a bit of carving to do, guess where? 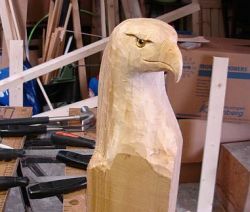 For the Eagle’s head I had brought a piece of the wood they use for making wooden shoes. 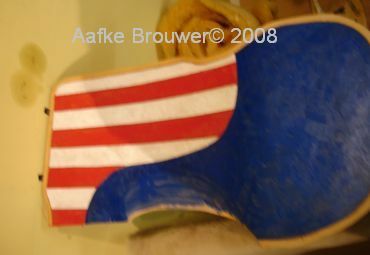 That’s the Dutch bit in this saddle! I spent a whole night cutting and carving wood, because I really wanted to show the saddle on the ”Equitana” horse show in Germany and I was seriously running out of time. It was later to be painted but a stuck in one of the glass eyes for the picture. I left it a bit rough on purpose, that way it blends in naturally with the leather carving on the saddle. The finished head on the finished saddle! The American Eagle has it’s own stand. I think it looks quite happy with it. 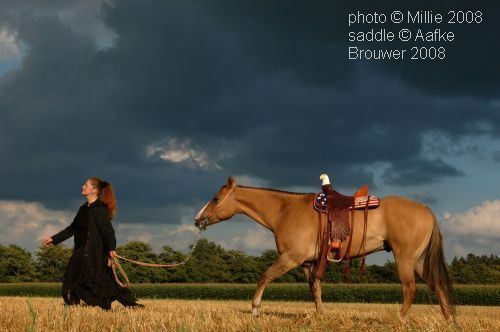 And a picture of me, with a classic quarter horse, the American Eagle Saddle, and a very Dutch sky in the background. Wow, Aafke – is there anything you DON’T do? You continually amaze me!!! Absolutely breathtaking! I want one, would you ever consider making them to sell? I think one is enough. But I will sell this one. Contact me via the form on this site. It’s mindboggingly expensive. You didn’t know that I trained as a western saddle maker? It’s not economically viable. And the guy whom I was partnering in business with took off with my money and left me with a huge mess so I stopped doing it. I am a really bad skater. For a Dutch girl. Wow! I love the last picture. Very nice! This will extremely marketable in Texas (hint hint) and other places in the USA! Suzanne,the last picture was made by a real photographer, it shows doesn’t it? Bedu, I am counting on marketing it! Aafke, you really are amazing! I recognized the talent that went into this, but I am so tired of patriotic imagery in the US that I have a hard time getting past that. 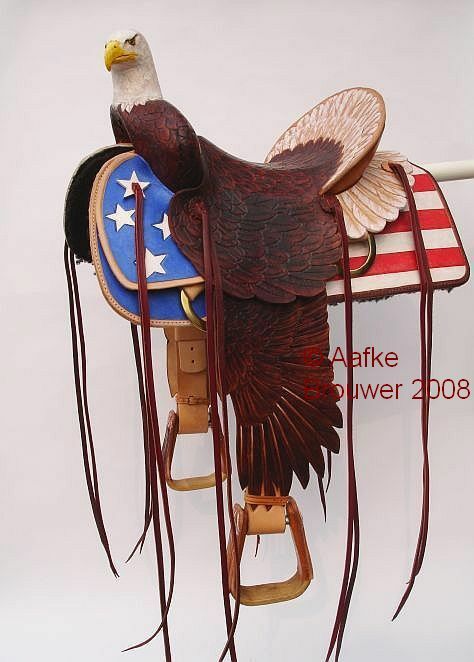 AA, that is a fantastic saddle!!! I have been around horses (and saddles) off and on all my life and I have never seen anything like it (well, except on custom bikes but that doesn’t count). Most of the fancy saddles from my youth were a matter of how much silver, brass, torquoise and tooled leather could be thrown at the standard western saddle. It is nice to see a work that is creative, elegant and simple.